Another fall semester commences next week at Iowa State. After spending five years in Ames I graduated this past spring and am now working as an interim intern at my favorite CR design firm. While I enjoyed my time in Ames, I can’t say I’m too upset about not going back next week. The following, unfinished post might begin to explain why. Please excuse its incompleness, possible out-of-dateness, and the composition skills of a younger me. I began writing this description of Ames back in December 2008. Finals were over at Iowa State and half the population of Ames had left. 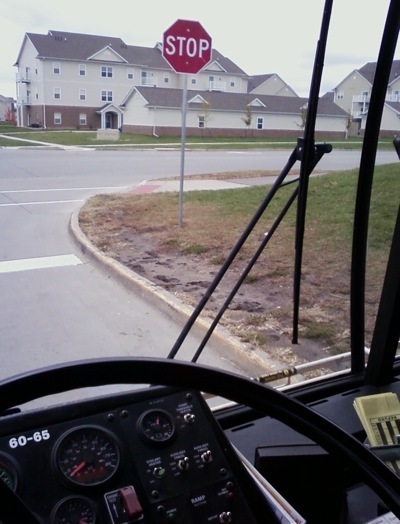 I stayed in town for a few days to work extra shifts at CyRide – only a few passengers riding my bus. In the middle of winter when students leave, Ames turns into a very empty and lonely place. I was living in Frederiksen Court north of campus at the time, which I always found to be disconnected from the rest of campus and similarly the city. The whole city of Ames is physically fragmented and divided by greenspace surrounding Squaw Creek. The original city of Ames, where downtown is located, developed about half a mile east of the creek; but when Iowa State was founded, the campus was developed just to the westof the creek. While homes and businesses have been developed to the west of campus, and addition development has taken place to the north and south of the original city, a noticeable void in the middle still remains. Unlike the University of Iowa, which developed its campus right adjacent to downtown Iowa City, ISU was built in empty farmland, a mile away from town (after all it is an ag school). Because of this, Ames does not have the vibrant and unified, central downtown like Iowa City, but instead two, sort-of ok “downtowns” and no established “heart” of the community. Lincoln Way, the main east-west drag through town, divides Ames into north and south. It owes its name to the original Lincoln Highway route, running right through the center of town (the modern Highway 30 is now a freeway on the south fringe of town), and was a major development and redevelopment force through Ames’ history. Around the university Lincoln Way is actually quite nice and walkable, but everywhere else it leaves much to be desired. To the east of campus, the road passes through vast open land of the Iowa State Center complex to the south, and intramural fields to the north near University Boulevard, before crossing Squaw Creek. Despite giving visitors the impression that Ames is a sparse, wasteland of meaningless greenspace and parking lots, University Blvd. is the designated gateway to Iowa State. Along Lincoln Way, the southern edge of campus, is Campustown, a small business district and neighborhood that developed organically right to the south of campus in the late 19th through mid-20th century. Established storefronts line two or three blocks of Lincoln Way and about two, north-south blocks of Welch Avenue. Home to numerous bars, some places to eat, and a few miscellaneous stores and businesses, the neighborhood serves ISU well. Surrounding the commercial district are older houses – mostly used for student rental housing; fraternity and sorority houses, walk-up apartment buildings, and even a few apartment highrises. Mostly built in the 1990s, the highrises were not held to very strict design standards so they were built cheap, are unattractive, and while increasing the density of Campustown (good), it degrades the aesthetic and historic integrity of the area. A few years ago the City of Ames passed a moratorium on new highrises to preserve the historic scale and charm of the area, but an ordinance requiring better design would serve the area much better. My appreciation for the walkability and mixed-uses in Campustown should not be understated, coming from my freshman year at North Dakota State, which lacked any established campus town area for students to gather and identify as their own. Campustown sustains vibrancy around campus into the evenings and late into the night on weekends. It grounds Iowa State as a place with people, with activity, with life. However the commercial area is relatively small and there is little activity when students are away. Locals tend not to frequent this area – not much to offer them besides the bars – so interaction between students and members of the community is generally limited. A mile down the road is the real downtown Ames. It is certainly nice enough, but railroad tracks divide it from Lincoln Way to the south, creating a physical and mental barrier. With that, when driving or walking down Lincoln Way, it’d be hard to know you’re just a block from the city’s historic center, as auto-oriented businesses and the Lincoln Center shopping center has dominated this stretch of road for decades. Main Street is a well-kept stretch of continuous storefronts with some fine dining and specialty shops. There are a few taller buildings (maybe five or six stories max) in downtown. The tallest, most dominant structure in downtown is of course the Ames power plant, situated across Duff Ave at the eastern terminus of Main Street, literally the end of town. Away from Main Street, buildings are spaced out as many historic structures have been demolished over the years for parking and ugly bank buildings. The combination of open lots, railroad obstacle, and literally being just blocks from undeveloped land, downtown has a certain vulnerable feeling to it. It is exposed. Except to the north where it flows fairly harmoniously into a historic residential area, downtown seems cut off to the rest of town, especially its most active arterials (ie. Lincoln Way). Downtown is never visibly very active and the fragmentation of former built-up, urban density does little to create a cohesive, continuous, united-feeling city center. Ames’ main big box commercial strip is South Duff Ave between Highway 30 and Lincoln Way. Right on the edge of town, the backsides of most businesses face cornfields. Big box destinations include: Target, Super Walmart, Best Buy, Kmart; and south of 30 are Lowes and Sam’s Club. The whole stretch is a mismatch of old remaining sheds and non-retail commercial buildings, next to newer, cheaply built chain stores and restaurants. Most of the big boxes are located far away from the street with enormous parking lots in the way. Some fast food outlets and strip buildings are closer to the road but there is no continuity or consistency. The great distances between buildings and lack of any real massing of building by the road make it feel insecure and aesthetically awkward. Decorative, almost pedestrian-scaled street lamps line the street, but do little for walkers when there isn’t even a continuous sidewalk on either side. And don’t even think about direct pedestrian paths from the street to entrances of stores and restaurants in places a sidewalk does exist – that would certainly be too much to ask. Honestly the most, consistently active place I know is inside North Grand Mall. Located at the north edge of town, mostly surrounded by medium and low density residential, the mall is not physically well-kept, but maintains decent occupancy and mid-level retailers because it’s the only one in town (though a new “lifestyle center” mall is supposedly in the works at I-35 and E 13th Street). To compete with the new mall, North Grand is proposed to undergo a major renovation that will transform the entire south end (former Sears and Walgreens location) in to an outdoor, mini lifestyle-center adjacent to the spruced up existing indoor mall. Despite being announced well over a year or two ago, little has happened with either shopping center development. One glimmer of hope, though – a new, stand-alone Walgreens has been built at North Grand as an outparcel by the main entrance. This opens up the old attached Walgreens space, with the already vacated Sears store to make way for the “Shops at North Grand.” Regardless the new Walgreens is an attractive building and fills part of the long spatial void of the parking lot along Grand Ave.
Also in the area – a Wal-Mart and Cub Foods are located north of the mall. Further north is a small strip mall with a terrible name, “The Northern Lights Center.” The commercial buildings are generally surrounded by inexpensive apartment complexes, duplexes, and then flows back into single family neighborhoods. At some point during the past year the doorways along the open corridors in the College of Design were painted – second and third floors with a light blue, and fourth and fifth floors with an off-green. While I welcome the addition of color (even dull ones) to the otherwise monochrome COD, I see a missed opportunity to enhance the building’s [lacking] way-finding system through a logical use of different colors. Instead of only two hues, seemingly chosen randomly, each floor should have its own color to define it and engage our visual sensory. Occasionally when I need to stop by a professor’s office in the College, I always have trouble remembering which floor they are on. The only directory on display in the building is located on the first floor by the main entrance, which is typically not convenient if I am already up in my studio. If each floor had a color coded system it would be easier to remember an office on “the orange floor” for example. Some might argue this is a cliche type of building signage, but if we’re painting anyway it might as well be with reason. There’s even a possible color scheme already devised by the Design Council’s recycling posters hanging up around the college. LANE4 Property Group is a development company hired by the City of Ames to devise an implement a plan to redevelop Campustown into a more vibrant and attractive commercial district serving the Iowa State University community. Campustown has great potential as illustrated during a public meeting in the MU on Sept. 29, where LANE4 presented a preliminary concept of what the neighborhood could become. Major components proposed include bringing back a small grocery or drugstore, a small hotel – which would take the place of the existing MU Hotel, office space (much of which will be leased by ISU) to increase daytime activity, a greater variety of dinning options, and a unique movie theater that could double as lecture hall space for the university. While specifics are yet to be determined, the redevelopment project would likely replace a majority of the existing buildings, which I have some reservations about. However, if certain historic and architecturally significant buildings can be restored and integrated, it is certainly worth some demolition of less critical buildings. Campustown redevelopment will occur in phases over time, but some construction could begin within a year according to LANE4. A letter in the October 7th Iowa State Daily expressed concern over university offices and lecture facilities locating in Campustown, so I wrote a response explaining why it is critical for the university to be involved. Certain new uses and business likely could not be sustained without the partnerships that are being proposed. You can read my letter in the Iowa State Daily here. I took this photo on my cellphone a couple weeks ago at the endpoint of Red West. This stop is in front of Ames Middle School, across the street from apartment complexes that house hundreds of college students. For certainly one of the busier bus stops in Ames, you’d think there would be a sidewalk. It is a priority of CyRide to upgrade its fleet and keep up with increasing service demand. However, the garage is basically at capacity and the roof is too low to fit hybrid buses, except for a few newer lanes, part of more recent additions. With no more room to expand on site, a satellite garage is rumored to be CyRide’s next step in facility expansion. It will be interesting to see what happens if all or even part of CyRide’s capital requests are approved and they have addition buses arriving in the next two years. Additionally, the Ames City Council approved $93,000 from local option sales tax revenue, for city-wide fare free service this summer. The vote passed 4-2, with council members Riad Mahayni and Jami Larson voting no. Mahayni, a former CRP professor of mine, was concerned with the fairness to ISU students who regularly ride for free, but pay for it through student fees. Larson wondered about the consequences of offering a one-time fare free period and the implications when the free service ends in the fall. Ultimately I think the initiative will get some additional residents on the bus and maybe persuade a few to continue when fares resume. I had not considered the fairness to students issue before, but the opportunity to increase long term ridership and community support is probably worth it. For the summer, CyRide will be unique among Iowa public transit agencies in providing fare free service to all, excluding Cambus which is operated by the University of Iowa and does not extend service beyond campus. 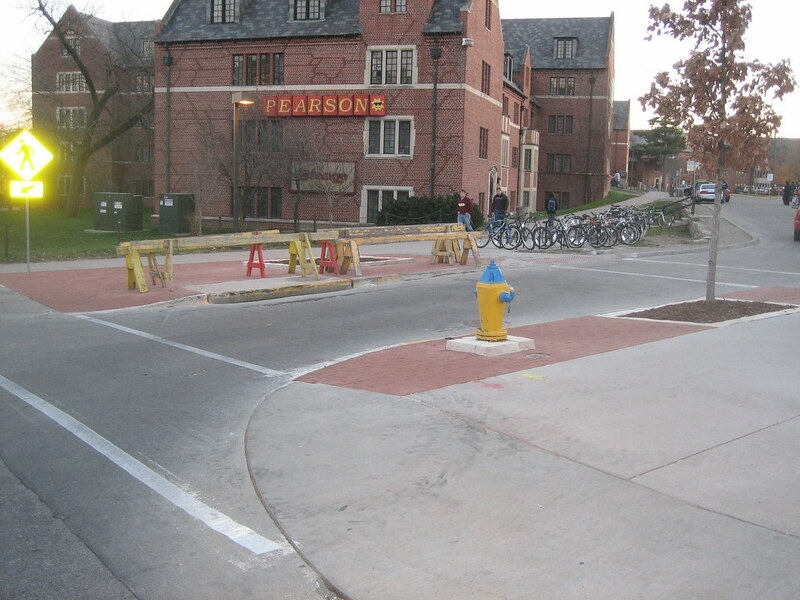 How appropriate for the first day back in class at Iowa State… Here’s a short clip from NPR Morning Edition from August 19, about concrete sidewalks being replaced with rubber to stand up to the occasional dropped keg at Lincoln Way and Welch in Campustown. Doing a Google search, it appears the story was picked up across the country for the day’s light-hearted news story. Edit: Apparently the rubber sidewalk has been installed along Chamberlain Street at Welch Ave next to the Campustown fire station (one block south of Lincoln Way). The sidewalk work at Lincoln Way and Welch appears to be for new traffic signals. The above photo I took Thursday, August 28. New brickwork and barrier chains have been installed outside of Friley Hall and Union Drive Community Center (UDCC) on the Iowa State University campus. The new brick replaces large dead, dirt spots where years of heavy pedestrian traffic has done its toll. I am always happy to see new brickwork on campus instead of all concrete sidewalks. It gives the already beautiful campus added character and visual interest. However I can’t say the same for the new metal chains. These pedestrian barriers are found all over campus restricting pedestrians to sidewalks as to prevent creating “cow paths” in the grass. A debate has sparked on campus after a Facebook group was created arguing over-use of these chains that many deem uglier than a few cow paths. I agree that some chains are necessary around campus but it now seems they are going up just anywhere and everywhere. These new chains between Friley and the UDCC look haphazardly placed amid a few small shrubs and a tree at either end. Mulch has been worn away around shrubs as thousands of students cut through daily going between Friley and the UDCC where a dining center is located. In such a high traffic area the landscaping strip at UDCC would be more suitable as a small strip of brickwork, like what was just installed nearby. The two trees could easily be preserved and maybe even a third one added, with space in between finished in brick. This would allow pedestrians passage, require little maintenance, and enhance the entrance into the Union Drive residential community. Instead of restricting pedestrians from cutting through by erecting unsightly metal chains, the Department of Facilities Planning and Management should work to identify and respond appropriately to pedestrian movement around campus.